More over, Fruit Facials and chocolate packs; There is new therapy on the block and this one means business. By using the most easily available form of energy in nature-the therapy promises to rejuvenate skin and give it a guaranteed glow. European light therapy (ELT) facials involve a new technology where light energy is applied to the skin to provide therapeutic benefits, accelerating the repair and replenishment of damaged cells, as well as stimulating the production of collagen. The treatment begins with the application of a deep cleanser followed by skin scrubber light probe. 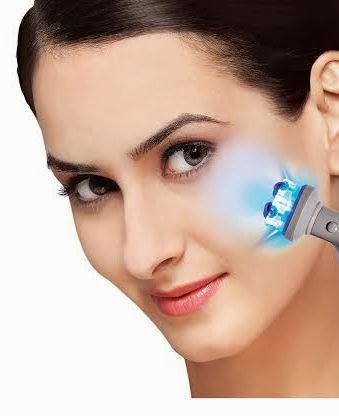 The blue light of the probe helps in fighting acne causing bacteria and also helps in removal of black heads while maintaining the pH balance of the skin. a peel is applied on the skin after this and followed by the scrubber light probe again, this time with the red light. The red light helps in improved blood circulation, treats pigmentation of the skin and evens out the skin tone among other benefits. The therapy ends with a relaxing scalp, neck and back massage after a facial mask. 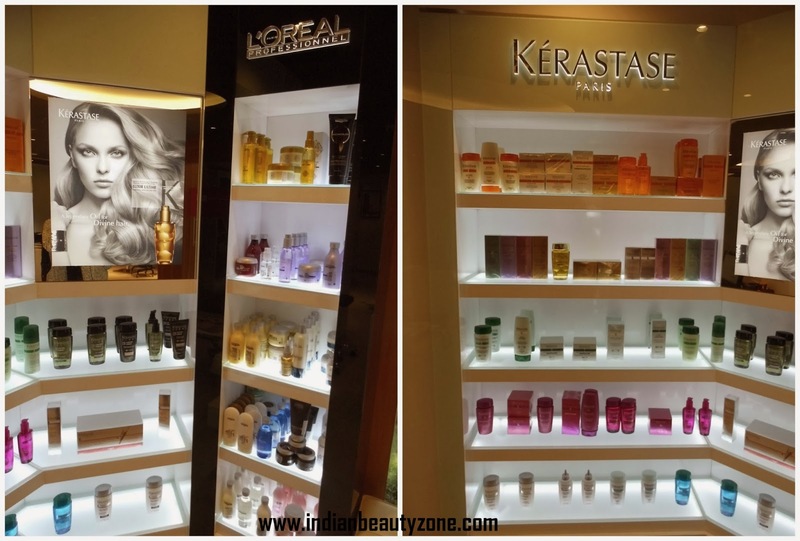 The products used are all unique to European facial and helps in rejuvenation of the skin. 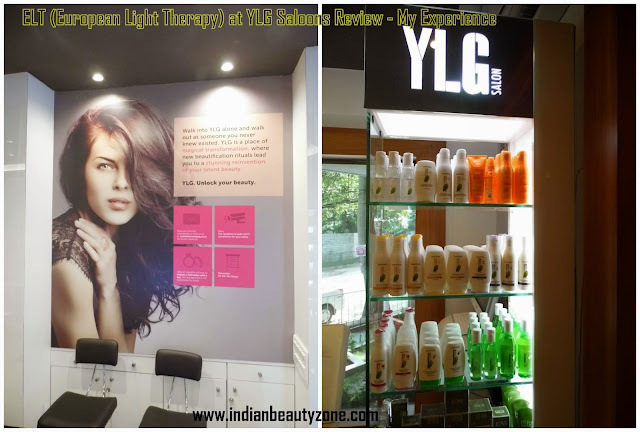 YLG Salon offers a range of signature facials involving ELT for various skin types and to address different skin problems, some of them being, pollution fighter facials, skin radiance, pure gold, pigmentation treatment, Lava, advance whitening and aroma therapy. Each of the therapy under European light therapy facials is tested by cosmetic dermatologists. Actually I was bit nervous to try this facial, because usually I won't go to beauty saloons for facial. This is the first detailed facial in my life that I have done in the YLG Salon. The Parlor lady chosen a particular facial called "Diamond Radiant ELT Facial" for me. There is a lot of varieties in this ELT facial available depends on your skin problem. My skin's main problem tanning and dullness. So, she requested me to try this facial that can enhance my complexion and removes tan. I was very happy to go with her idea and went inside the spa room. The saloon looks so neat and clean, I loved the atmosphere very much. There was a mild music playing around the saloon which makes the mood very calm. She did bleaching for my face first, I was very afraid to do that, still she convinced me to do it. Thank God, nothing happened and instead my face got brighten up immediately after the bleach. After that she started the ELT facial with a cleansing process with a great facial massage. Everything she applied on my face was very cool and soothing. After cleansing she did a mild scrubbing and then steaming, then cleansing again. Later she applied an enzyme face mask and left it on my ace for 15 minutes. After that she cleansed my face and started to apply the light therapy. She used both red and blue lights on my face according to the skin problem in the face. After that she applied an ice pack, which helps to close the pores and to tighten the skin. This facial timing is around one hour, but for me because of bleaching etc it took more than 1 hour. The ELT facial finished up with a great facial massage and also with neck and back massage. My face complexion improved very well after this facial and started to glow naturally. I am loving results very much and it is really very effective facial. The light therapy was very cool and I loved it very much. Hope to visit there for this amazing facial regularly. The Salon and the spa rooms are so neat and hygienic. The parlor ladies are so sweet and dedicated in their work. The massage done by the parlor lady is amazing. The waxing method at YLG is hygienic painless, cream based wax. They are special in Manicure and pedicure. The ELT facial is a must facial for those who wants really a good treatment to their skin. You can choose the facial according to your skin problem. The Diamond radiant ELT facial is really awesome and effective and made my skin radiance, improved my skin complexion very well. The ELT facial cost for 2,500, but it is totally worth. Your skin will feel the rebirth feeling after this ELT facial. PS:I was invited to try this facial for Review, my review is honest from heart.